Winter is Coming…To Your Sewing Room! I don’t always make posts that are not about showcasing a recent completed project but once in a while I have ideas for content that I think might be interesting, if not at least amusing. So I receive email updates from the Big 4 Sewing Pattern companies on a regular basis. The pattern lines are McCall’s, Butterick, Vogue, and Simplicity for those not in the know. The first three are from the same conglomerate company though! I like to peruse the latest sewing patterns and add whatever catches my eye to my ever expansive wishlist. I already have way too many sewing patterns and not nearly enough time to sew them all up but I derive a lot of pleasure from hoarding collecting sewing patterns. 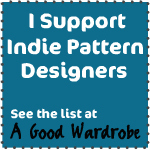 These days I’m much more selective though and I’ve been favouring indie sewing pattern companies. But the Big 4 still put out a few interesting designs in each collection that are worth putting on a wishlist. I get a happy little rush every time I see a new collection has been put out and eagerly click the link in the email notification I receive. This was hilarious! McCall’s actually put out two Game of Thrones sewing patterns in anticipation for the premiere of the next season on April 6 (today!). So for those of you who noticed this a couple of months ago, you could have made your very own costume, perhaps to wear to a season premiere party? Check out the two patterns — the first is M6940 which is very clearly supposed to be a Cersei Lannister costume. The sewing pattern illustration is even more of a dead give-away with the lions and her facial features! So maybe House Lannister isn’t your thing? How about dressing yourself like The Mother of Dragons with M6941? The Big 4 usually put out costume related patterns as a way to get in on the Halloween market. But I’ve been noticing in the past few years how they’ve really been putting in an effort to stay on top of the trends. McCall’s releasing these two patterns just a couple of months before the Game of Thrones season premiere is an excellent example of this. I’ve also noticed that they’ve been releasing Steampunk inspired patterns too. Anyways, I hope everyone has a happy time watching the Game of Thrones premiere. I’m one of those weirdos who tends to wait till everything has been released and then binge watches them over a few days. This year I might wait for 3 or 4 episodes and binge them in small batches. Till next time friends! The pattern I used for the project is Simplicity 2865 which is an older pattern from their Built By Wendy line, a collection of patterns I really like. I’ve got quite a few of them stashed away. I made this dress in a red and cream interlock knit fabric purchased from Dressew. This dress would have taken me a lot less time to sew if I didn’t have so many fitting woes! Can someone please remind me never to cut a size 10 in the Big 4 pattern companies? I’ve had nothing but trouble whenever I cut a 10. I should always be a 6 or lower. For this pattern, I should have cut the smallest size available which was a 4. I cut a 10 because the pattern said the finished garment measurements for the bust was 32.5 inches. WRONG! I really should have measured the bust across the pattern because it was a lot more than that. I had to take in the side seams by 1.5 inches on both sides but only on the back pattern piece because I didn’t want to alter the front armhole shape. I also had to take in the shoulder seam by 1.5 inches. Even with these modifications, I had to throw the finished dress into the washer on hot water and then into the dryer to shrink it up even more. I have a feeling even if I had cut a 4, it still would have been too big so it’s mostly the fault of my small frame. Luckily I did not have the recut the collar. Knit fabric is so forgiving to sew with! Anyways, I managed to get through the problems and now I have a cute dress. Here is a close up of the little red candy buttons I sewed to the placket. I also purchased these buttons from Dressew. Now the reason I call this dress the Olivia dress is because the inspiration came from a children’s picture book. Here take a look! Can you see what I mean? I even wore the black and white striped tights to really capture the spirit of Olivia. This is a book series about a very petulant, adventurous, imaginative little pig named Olivia, written and illustrated by Ian Falconer. She’s quite a fashionable little pig too. I love children’s books and as you know, I work at the public library so I constantly come across old classics and new ones to read. Children’s picture books are an inspiration to me because their whimsical nature is very appealing. I love to pour over the illustrations and get lost in a more dreamy place. I plan on sewing more projects inspired by children’s picture books in the future. I think this is a great way to combine two of my great loves in life — sewing and reading. So expect to see more of the other sides of my life (the book worm and in a previous post, the nerd) in this blog as I slowly reveal them. I finally took photos of this blazer jacket I made last fall! Yay for catching up on project photos! This blazer was made during one of my night classes and was a total labour of love, although it wasn’t too difficult. Only the collar was the difficult part really because I had never done a jacket collar before. This pattern is Simplicity 2446, which is part of their Amazing Fit series. Oh my god, I love this pattern. There is an option to cut for an A-cup! I’m totally putting this into my TNT (Tried and True, for my friends not in the know) pattern stash. It’s fully lined! I feel so good about that. I lined it with a awesome satin fabric I found at Fabricland. All the fabric was from Fabricland actually. Jacket shell is made with a wool blend. It’s perfect for these cool early summer nights in Vancouver right now and will be perfect for late summer in September too. I loved doing the contrast details in the same satin I used for my lining. Gives it such a pop! I have to confess that these are fake pockets though, I was too lazy to make real ones. Those are also fake sleeve vents (which were super fun to sew). Real ones next time! In terms of outfit details, the jeans are from Urban Planet, blouse is from Urban Behaviour, and the shoes are Vans ballet flats. I can’t think of any other name to describe this dress that I made last August/September for my Aunt Lil’s wedding…it’s made of bright yellow crepe-back satin that I got from Our Social Fabric at one of their earliest sales. The fabric reminds me of Belle’s yellow gown from Beauty and the Beast. It’s not in the same style but the fabric is such a sunshiney and shimmering yellow. The pattern is Simplicity 3620 and the dress is lined except for the puff sleeves. I cut the smallest size, so a size 6, because I noticed how much ease was in the pattern! I was pretty happy with how this turned out! Other than some very minor details I would fix if I made a second one, such as the neckline gapes just slightly and the armholes are a smidgen tight, I love this dress! It’s sooooo satiny though that it’s definitely a special occasion dress. Needs a good steaming too if I were to take it out for another outing. I’ve got a few more old projects that still need photo taking. And my isn’t my hair getting long? Till next week lovelies!